A Caribbean Slammer is another cocktail that just screams tropical party drink. It is light and refreshing and very tasty. Whether you are at the pool or the beach, this cocktail will be a hit with everyone. In a large cocktail shaker, add a few ice cubes, the lime juice, rum and fruit juices. Shake well. Strain into two cocktails glasses filled with ice. Drizzle some grenadine on top. Top off with a little lemon lime soda. Do not stir. 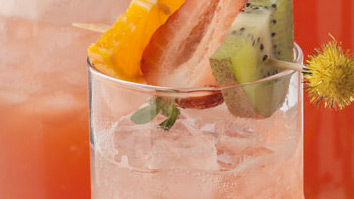 Garnish with a long cocktail pick with various fresh fruit pieces. Serve and Enjoy ! Little more zip. Serve and Enjoy ! In a large cocktail shaker, add a few ice cubes, the lime juice, rum and fruit juices. Shake well. Strain into two cocktails glasses filled with ice. Drizzle some grenadine on top. Top off with a little lemon lime soda. Do not stir. Garnish with a long cocktail pick with various fresh fruit pieces. Serve and Enjoy! *Non-alcoholic recipe: Follow the recipe from above but omit the rum and use ginger ale for a Little more zip. Serve and Enjoy !